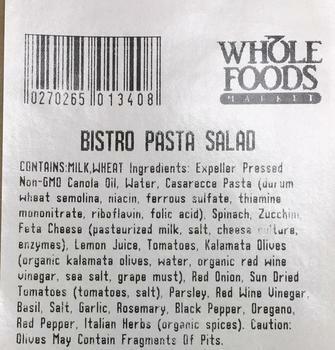 Whole Foods Market is recalling various prepared foods items in eight states containing baby spinach following an earlier recall by Satur Farms. The products, which were sold through January 23, 2019, may be contaminated with Salmonella. The recalled products were sold at stores in Connecticut, Florida, Maine, Massachusetts, New Hampshire, New Jersey, New York, and Rhode Island. Customers who purchased the recalled products should discard them and bring a valid receipt into stores for a full refund. Consumers with questions may call (844) 936-8255 between from 7:00 a.m. – 10:00 p.m. (CST) Monday through Friday, or 8:00 a.m. – 6:00 p.m. Saturday and Sunday.